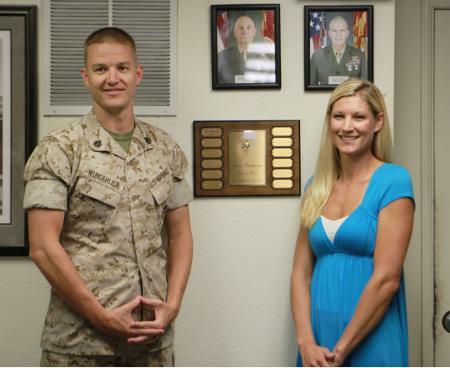 Rachael Wunderlich, the recipient of the Irene Ferguson Marine Wife Recognition Award 2011. Rachael a Monterey, California native, stands with her husband, Staff Sgt. Corey Wunderlich, an airframes mechanic with Marine Heavy Helicopter Squadron 465 and a St. Louis native, for the first inducted IFMWRA at the Flying Leatherneck Historic Foundation and Aviation Museum here Aug. 30, 2011. The award honors and highlights the resiliency, strength and dedication that the United States Marine Corps wife embodies as she supports service members.